NAMIKI667 is a welcoming space for all, where there are dishes to be shared, and drinks to be had. NAMIKI667 prides itself on offering a full sensory experience of taste and style. Cocotte recipes and other oven-based slow-cook specialties feature fresh Kanto-area produce and showcase its delicate rendering of complex flavors. 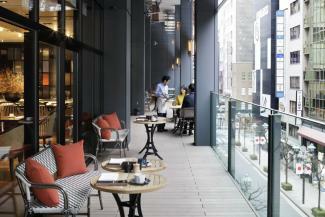 Tables on the generous 100-square-meter (1,076-square-foot) terrace overlook the lane from which the restaurant takes its name—seating that promises to be among the capital’s most coveted reservations. A private dining room seats up to 24 for intimate gatherings. The bar, as well, promises to make NAMIKI667 a sought-after venue for casual get-togethers with friends, families or that special someone. An Unprecedented 12,000 Reservations in 10 Days!